Sarah Wild, multi-award-winning science journalist and science editor at the Mail & Guardian, has identified the five key scientific areas we should keep our eyes on in 2016. “Science continues to shift the boundaries of what we think we know and 2016 will be no exception,” she writes. The five key areas this year will be, in no particular order: SKA and MeerKAT, Lee Berger, gene editing, the Large Hadron Collider and Mars. 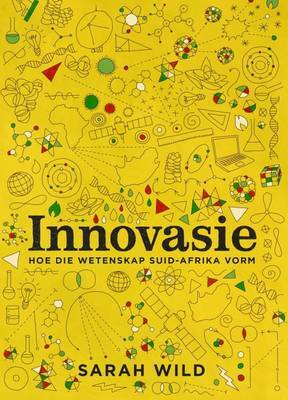 Wild’s book Innovation: Shaping South Africa through Science, also available in Afrikaans as Innovasie: Hoe wetenskap Suid-Afrika vorm, is a celebration of the science and innovation happening in South Africa right now, addressing real problems on the ground and helping people to live healthier, happier lives. Palaeoscientist Lee Berger wowed the world in 2015, when he unveiled possible human ancestor Homo naledi and a treasure trove of skeletons in the Dinaledi Cave, in the Cradle of Humankind in Gauteng. Berger, a professor at the University of the Witwatersrand and National Geographic explorer-in-residence, was also responsible for the discovery of Australopithecus sediba in 2008 – another hominin. While there has been controversy about the Homo naledi find – from the scientific community, with question marks over the researchers’ conclusions, and from South African society at large, where the announcement sparked a race row – there is no doubt Berger has remarkable talent. He makes finding hominin fossils, some of the most rare and precious artefacts on Earth, look easy. Xolani Gwala recently called on Kevin Richardson, animal behaviourist and co-author of Part of the Pride, to give his opinion on the recent lion attack at the Lion Park near Lanseria on Talk Radio 702. In the podcast, Richardson reminds listeners that lions are wild animals that people should be wary of. Gwala asks Richardson if he thinks videos of “Lion Whisperers” like himself encourage dangerous animals. 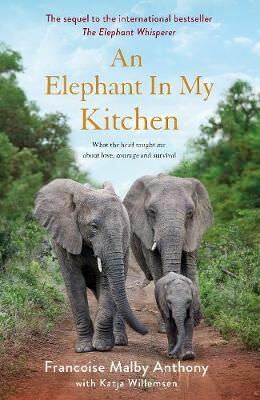 Richardson responds by saying that there are “experts in every field,” and ordinary people should not try to handle lions because they saw a professional do it anymore than they would attempt heart surgery after seeing a trained surgeon at work. Are Trout South African? : Stories of Fish, People and Places by Duncan Brown has come second in the Diagram Prize for Oddest Book Title of the Year, sharing the spot with The Origin of Feces by David Waltner-Toews. The winning title is How to Poo on a Date: The Lovers’ Guide to Toilet Etiquette by Mats and Enzo. In Are Trout South African? Brown discusses notions of identity and belonging, using the history of trout in South Africa as a way of exploring these issues. 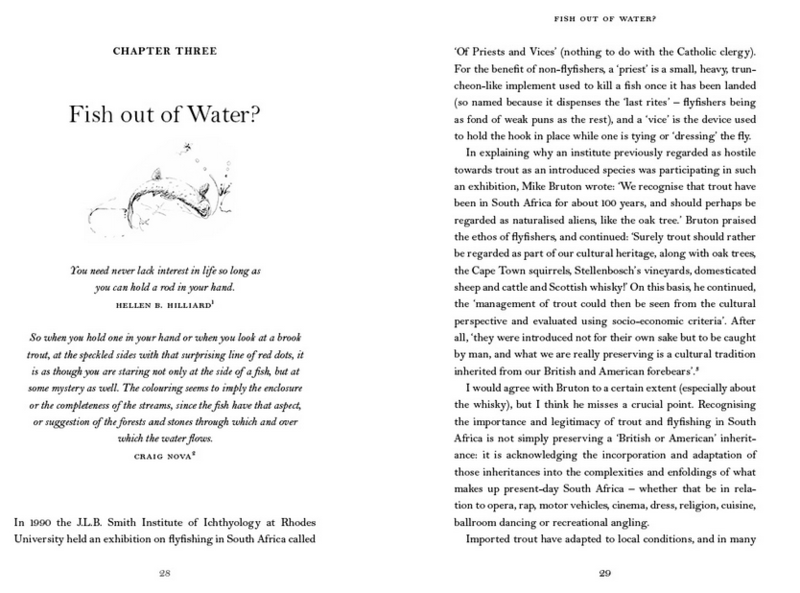 Kevin Shenton has shared a number of pages on Behance from Are Trout South African? : Stories of Fish, People and Places by Duncan Brown. Read the first few pages from Chapters Two and Three and see the contents page as well as photographs of Brown’s various fishing expeditions. Herbst writes that he was conflicted about including Brown’s book as he is featured in one of the chapters, but he says that several of his friends read the entire book in one sitting, so he is assured that it’s an enjoyable read. "Are Trout South African?" is the Flyfishing magazine's book of the year! Congrats @DuncanJBBrown & @PanMacmillanSA pic.twitter.com/5BdY9Wbco8"
It is said that there have been more books written about flyfishing than any other outdoor pastime. Each year seems to add to the tally and the available range has been increased by DVDs and e-books. They make ideal Christmas presents so, with the help of Craig Thom of StreamX/Netbooks, I have drawn up the following list of what we regard as the best books and DVDs which have reached the market in the past year. Without a doubt the book of the year is Are Trout South African? (Pan Macmillan) by Duncan Brown. Peter Brigg reviewed it in the October/November issue of this magazine, and if you Google the title and Neels Blom you will see his review in Business Day. The book contains a chapter about me, so I am somewhat conflicted in mentioning it, but several of my friends read it cover to cover in a single session, so it obviously is enjoyable. Furthermore, it comes at the ideal time to assist debate over the controversial new NEM:BA legislation. 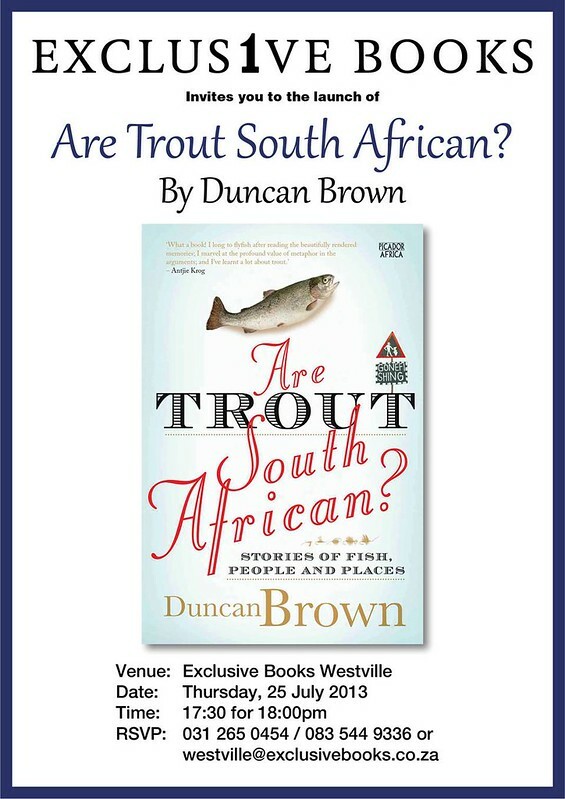 Exclusive Books invites you to the launch of Are Trout South African? : Stories of Fish, People and Places by Duncan Brown. 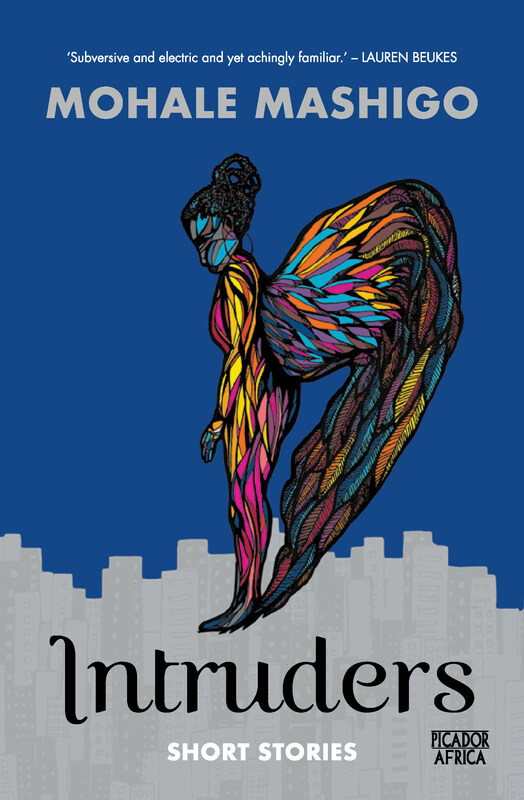 The event starts at 5:30 PM for 6:00 PM on Thursday 25 July at Exclusive Books Westville. The Main Road in Kalk Bay, which is finally open to two-way traffic after some years of roadworks, was awash just hours before the launch of Duncan Brown’s fascinating new book, Are Trout South African? : Stories of Fish, People and Places. Tim Butcher, a Kalk Bay resident and author of Blood River, was there to chat to the author. He suggested that the flooding was a ploy by Kalk Bay Books’ new owner, Audrey Rademeyer, to lend veracity to the event’s theme of fishing. Brown’s book asks whether trout are special above other fish. They are some of the less invasive and threatening of introduced species. He said carp are not good for water quality, making the water turgid. They are not attractive to bodies of water. “The ferocity of the debate pivots around elitism, and colonialism,” said Brown. Butcher said, “This is a subtle book about fishing, place, anthropology. It makes one ask what does it mean to think about place in the complex region that is South Africa.” Norman Maclean’s famous novella, A River Runs Through It, ends with the last line, “I am haunted by waters”. Are Trout South African? explores how human identities are interposed with the natural environments and species they support, particularly as regards the waterways they frequent. Brown loves fishing. For him it is about solitude and quiet company rather than the esoteric technical issues about how to tie a fly. “It’s about an immersion in a world that requires behaviour of a different fashion,” he said. “You have to alter the way you read, noticing the water and the wind. Fishing is a significant and humbling activity, not just because of my astonishing lack of success.” Fishing offered him something around which significant relationships had been formed, in particular with his father. As he lay dying, he insisted that his son release a four-pound trout from the end of the hospital bed. Soon after his passing, Brown took the rods he had inherited from his father and, much to his surprise, he caught a fabulous four-pounder. This was just the sort of synchronicity that flyfishing attracts, suggested Buthcher. Pan Macmillan and Kalk Bay Books are pleased to invite you to the launch of Are Trout South African? : Stories of Fish, People and Places by Duncan Brown. Brown will be in conversation with Tim Butcher about his book on Wednesday 26 June at 6:30 PM for 7 PM.